Rajasthan Royals 6-142 (Brad Hodge 52*, Ajinkya Rahane 52, James Neesham 3-22) beat Otago 7-139 (James Neesham 32, Nathan McCullum 28*, Rahul Shukla 3-23, Kevon Cooper 2-33) by four wickets. Otago scored 139 runs with three wickets still in hand at the end of the scheduled 20 overs and Rajasthan Royals thrashed 142 for the loss of six wickets and five balls to spare. Rahul Shukla (Rajasthan Royals) was declared ‘Player of the match’ for his heroic bowling spell of 3-23. The 18th match of the Champions League Twenty20, Group A was played on Tuesday, October 1, 2013, at Sawai Mansingh Stadium, Jaipur. Earlier, Rahul Dravid, the captain of Rajasthan Royals, won the toss and sent Otago into bat first. Neil Broom and Hamish Rutherford scored 16 runs in three overs with 3 fours when Rahul Shukla removed three top order batsmen in the next over. 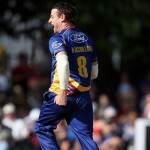 Rutherford, Brendon McCullum and Derek de Boorder were sent back to the dressing room for 5, 0 and 0 runs while Broom became the fourth victim at 21 in 4.3 overs. Ryan ten Doeschate and James Neesham started the repair work under trying conditions. 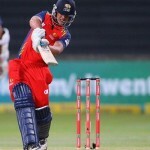 The latter was scoring most of the runs and hit 1 six along with a couple of fours in the 11th over as ten Doeschate kept on securing at his end. The partnership was dislodged at 74 as Neesham was caught by Shane Watson off Kevon Cooper for 32 from 25 balls with 1 six and 4 fours. Ryan ten Doeschate followed him seven runs later for 26 as Nathan McCullum and Ian Butler took their team towards consolidation. Butler hit 2 sixes and 1 four in the 17th over and was clean bowled by Cooper for 25 while Nathan McCullum was still at his end at 28 as Otago managed 7-139 in 20 overs. Rahul Shukla was the super bowler with three wickets, Kevon Cooper held two whereas Shane Watson and Pravin Tambe got one wicket each. Rahul Dravid along with Ajinkya Rahane stared off nicely by scoring 15 runs in the very first over with 2 fours. The latter was the most aggressive of the two and was sending the ball out of the fence regularly. Dravid lost his wicket at 49 in 6.4 overs at his personal feat of 10 runs. James Neesham brought his team back in the game while ripping through the middle order batting of the home side. 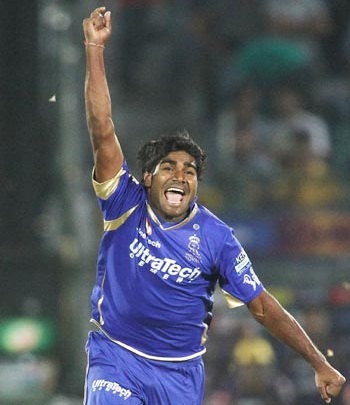 He got three important wickets of Sanju Samson, Shane Watson and Stuart Binny for 5, 2 and 1 runs. The home side was reeling at 4-72 in 12.1 overs when Brad Hodge joined in next with Rahane and the first hit 11 runs in the 15th one with 2 fours. Rahane completed his 15th Twenty20 fifty as Hodge dispatched 2 sixes and 1 four in the following over. Ajinkya Rahane was caught by Broom at mid off at the bowling of Neesham for 52 from 48 balls with 7 fours. The stumps of James Faulkner were destroyed by Neil Wagner for two and the incoming batsman Kevin Cooper hit 2 fours after his arrival at the crease. Brad Hodge smashed his 38th Twenty20 half century with a four and won the match for his side. He remained unbeaten for 52 off 23 mere deliveries with 3 mighty sixes and 5 fours as Rajasthan Royals powered 6-142 in 19.1 overs. James Neesham was the highest wicket taker with three, Neil Wagner took one whereas Nick Beard chipped in with one wicket. Rajasthan Royals clinched the game against Otago by a margin of four wickets and qualified for the semi final spot.